Enterprise strength Penguin Power... in a plain White Box! Welcome to the White Box Linux project. Good grief, has it been that long since an update. Life keeps happening. Anyway, the archive is offline for a few days. Have a replacement motherboard airborne so should be back up by Monday. No the WBEL5 images aren't cooked yet. But lots of WBEL3 and WBEL4 errata should have made it to the mirrors this past weekend. They just don't make hard drives like they used to... RAID and regular backups save the data but it takes time to fight dead drives. Major release and errata announcements. A list for general users of WBEL to discuss issues and generally help each other out. The currently active list for people interested in helping build the next version of WBEL. Discussion on getting a stable and supported ia64 port. This product is derived from the Free/Open Source Software made available by Red Hat, Inc but IS NOT produced, maintained or supported by Red Hat. Specifically, this product is forked from the source code for Red Hat's _Red Hat Enterprise Linux_ products under the terms and conditions of its EULA. There may be remaining packaging problems and other odd bugs. These are solely the responsibility of the White Box Linux effort and should not in any shape, manner or form reflect on the quality of Red Hat's commercial product. In fact, if you need a fully tested and supported OS you probably should go buy their box set. A fair amount of effort has gone into removing Red Hat's trademarks and logos. Should you find one remaining, please report it so that it can be removed. Write me about this and any other problems at jmorris@beau.org. Or join the devel list and dive in! What is the goal for White Box Linux? To provide an unencumbered RPM based Linux distribution that retains enough compatibility with Red Hat Linux to allow easy upgrades and to retain compatibility with their Errata srpms. Being based off of RHEL3 means that a machine should be able to avoid the upgrade treadmill until Oct 2008 since RHEL promises Errata availability for five years from date of initial release and RHEL3 shipped in Oct 2003. Or more briefly, to fill the gap between Fedora and RHEL. Why was White Box Linux created? 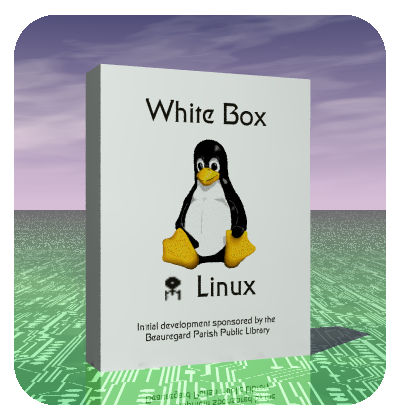 White Box Linux's initial creation has been sponsored by the Beauregard Parish Public Library in DeRidder, LA USA out of self interest. We have several servers and over fifty workstations running Red Hat Linux and were left high and dry by their recent shift in business plan. Our choices were a difficult migration to another distribution or paying RedHat an annual fee greater than the amortized value of our hardware. So we chose a third path, made possible by the power of Open Source.... White Box Linux. Download and install White Box. Poke it in unexpected places and see what breaks. Report problems so they can get fixed. As with all Open Source efforts, bug reports are good, patches are better still. This software is believed to be freely redistributable under the terms of the Free/Open Source licenses of each of it's components. However, to the maximum extent allowed by the laws of the United States and the State of Louisiana, the Beauregard Parish Library disclaims any and all responsibility for this product. It is your responsibility to determine the suitability of this product for your intended purpose and the legality of using, modifying and reproducing it in your jurisdiction. "Red Hat" and the Red Hat "Shadowman" logo are registered trademarks of Red Hat, Inc. "Linux" is a registered trademark of Linus Torvalds. All other trademarks are the property of their respective owners.